When we are faced with a new enemy, that is seemingly unbeatable, we need to investigate its weaknesses and then perhaps we can see a way to exploit these weaknesses, as the English cricket team did in 1932. Common sowthistle in North-eastern Australia, for example, appears unbeatable. It can germinate all year round, with a single plant producing up to 25,000 wind-dispersed seeds. Many of these seeds are able to germinate straight away (having no dormancy), glyphosate resistance is now becoming very common, and our no-till farming system has played right into its hands leaving most seed on the soil surface from where it can germinate. What a nightmare! Surely this weed is unstoppable. But if we take a look at its weaknesses, we can perhaps see some options. Research by Michael Widderick from QDAF tells us that its seed is short-lived (as little as eight months), seeds can’t germinate from a depth of 2cm or more, and it hates competition from the crop. 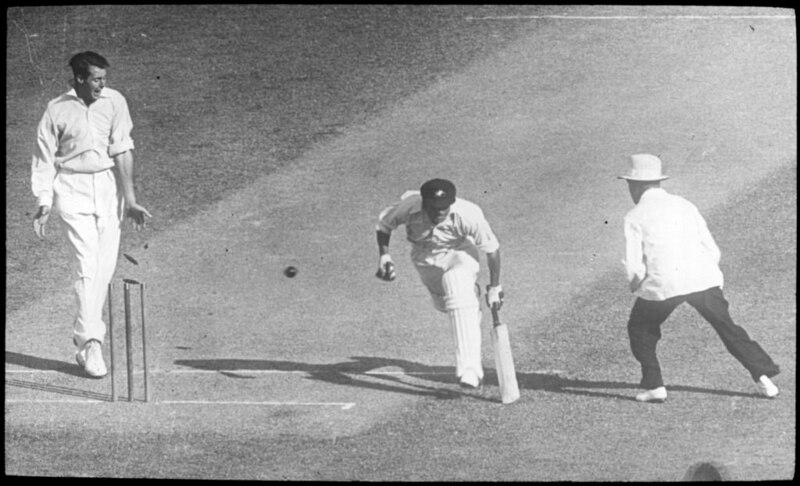 Sure, glyphosate resistance makes life hard, but if we think a little like Douglas Jardine, the English cricket captain in 1932, perhaps we can see a way forward. To learn a little more about the biology of sowthistle and how we might beat this weed in the long-term, read more. Common sowthistle (Sonchus oleraceus) also known as milk thistle, was rated the 5th most difficult weed to control in winter crops in the Northern grain region of Australia and is widespread throughout Queensland and Northern NSW. Sowthistle will happily germinate at any time of the year if there is adequate moisture making management challenging as plants are present throughout much, if not all, of the year. It can be common in both summer and winter crops and fallows, with multiple generations within a year. Glyphosate resistance was confirmed during a 2014/15 survey of the northern region (Annie van der Meulen, QDAF). In this survey, 123 populations of sowthistle were tested. 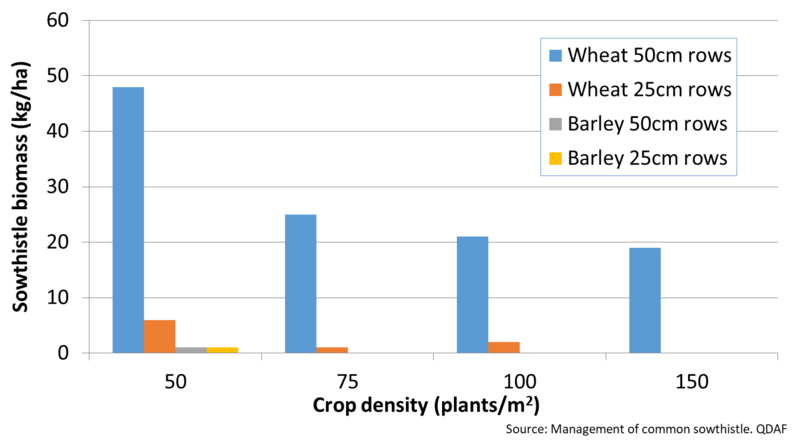 Out of these populations, 34 were either resistant or developing resistance to glyphosate. While there was a higher incidence of resistant populations in northern NSW (Liverpool Plains), one population from central Queensland was also confirmed as resistant. Righto, so what are some of the weaknesses of sowthistle that we may be able to exploit? One of Sowthistle’s ecological weaknesses is its much-reduced germination if the seed is buried deeper than 2cm in the soil (see Figure below). 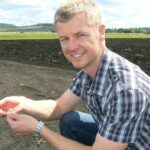 Germination is favoured when seed are on or close to the soil surface with no emergence from a depth of 2cm or greater (Michael Widderick, QDAF). While seed burial can reduce emergence, seed burial can also increase seed persistence. Sowthistle seed buried below a depth of 2cm can persist and remain viable for longer than seeds that are in the top 2cms of soil. 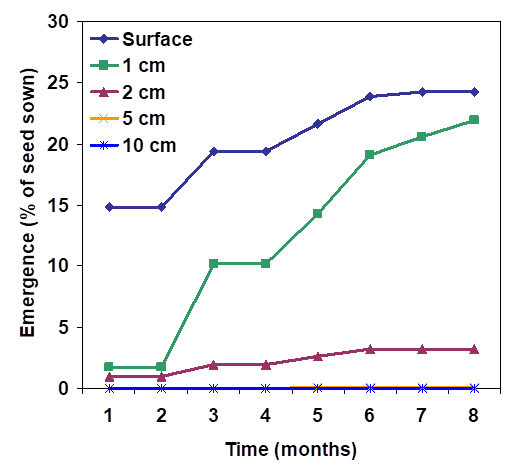 A study in Queensland found after 30 months of burial, 12% of sowthistle seed buried at 5 or 10cm, remained viable compared with less than 1% when seed was buried at 1cm depth. In short, if you plan to cultivate to bury sowthistle seeds, they must be left buried for at least 3 or 4 years before any more cultivation. In the absence of seed bank replenishment, studies by Michael Widderick, QDAF, have shown that sowthistle germination from surface lying seed will cease after approximately 8 months. This is good news as it tells us if we can keep a paddock weed free for a year or so, and the majority of weed seeds are on or near the surface, we can smash the sowthistle seed bank. Cultural weed control practices to increase crop competition such as reducing row spacing and increasing crop density are effective. The data below shows how much Sowthistle hates competition. This research was conducted in the absence of selective herbicides for sowthistle. This effect is common across a range of weed species with some suffering more than others at the hands of a competitive crop. Certainly, using herbicides in combination with crop competition will reduce weed density and seed production in crop and lower the weed seed bank in your soils. This will result in a lower sowthistle pressure in fallows, where non-chemical options are limited. Sowthistle has become a very common weed in summer and winter fallows and crop and resistance to glyphosate is making management difficult. To defeat an opponent, we need to exploit their weakness, and in the case of sowthistle, it appears that two of the key weaknesses is its inability to compete with the crop, and its inability to emerge from greater than 2cm. Add to this the short seed life and we are starting to understand what a bodyline series against sowthistle might look like.